Hopper question for you all - How much movement do you give your hopper (if any) when it's on the water? Do you give it a twitch or skate it at all? I've read that a twitch sometimes is essential to getting a strike. But in small stream, short cast conditions like this the take will come within moments of the fly hitting the water. You can see that pretty clearly in the video. Sometimes I swear the Trout are actually tracking the hopper while it's in the air. If you're fishing bigger water with lots of open space they will have longer to look at the fly, so then a little enticement might be needed. Another tip for small stream hopper pounding: use a short, heavy leader. No need for finesse here. 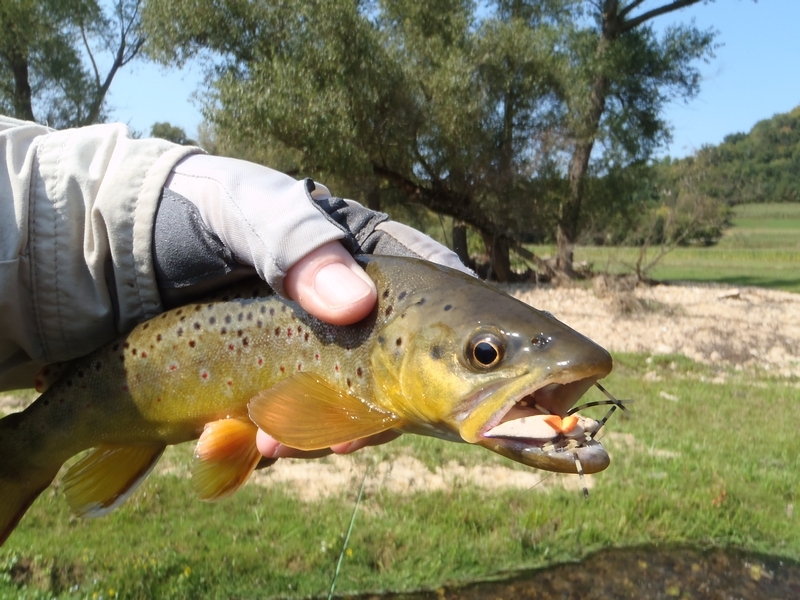 In fact, making the bug splat when it hits the water will often draw the attention of the bigger Trout. And also, be prepared to steer the fish away from undercut banks and protected holding spots. It's a knife fight in a phone booth, and a heavy leader comes in handy for dragging them out of cover. Also, a tactic that's paid good dividends for me is to back fish the best spots on the creek during the walk back to the car. Drift the hopper downstream to the hole, and then tug it underwater and start stripping fast. This will often lure a spooky Trout out from cover, as they can't resist what looks like fleeing food. I'm out of town the next two weekends, but hopefully I can find time during the week to get out there and sling hoppers. First a big brown on Friday and now a big largie this morning. Right up by shore in an open space amongst the weed beds. Big wake to the right... big wake to the left and then I no longer have the fish or my lure. Felt quite heavy and strong. At least I have this photo to remember my lost Popper by. Did get a few other largies including some nice ones but the big one got away. Still... cobbled together a fine weekend of fishing in spite of the rain. I need to get out and see what's around in impoundments. Rivers are all screwed up and the Madison chain, while on no-wake, is still the Madison chain. Yeah I wanted to get out in the yak this past weekend but the front and high pressure and cooler air made me think that the fish wouldn't play. Think I'll go somewhere this weekend. Maybe my last full day outing of the year before I go full trout till the season closes. Will be a tough call though as Fall trouting has already kicked in and it's been really good. More than a little bummed that my yak season may be at an end. Have other plans the next two weekends and then it will be October and I can’t imagine that I’ll spend fishing time anywhere other than trout streams till the 15th. Travelled with a buddy about an hour north of Madison to an area that has a number of lakes suitable for kayak fishing. Been going to these little lakes a bunch this summer. Fish weren’t really on and couldn’t buy a top water hit all day but did manage a to catch some fish… mostly micro northerns and small largies. First lake was a 50ish acre body with a max depth of 25 feet and lily pads and submerged weed fields galore. Gonna miss this kind of water if I don’t get back out this year. As I said, could not buy a top water hit but got 6 snakes, 3 small largies and a few keeper perch. 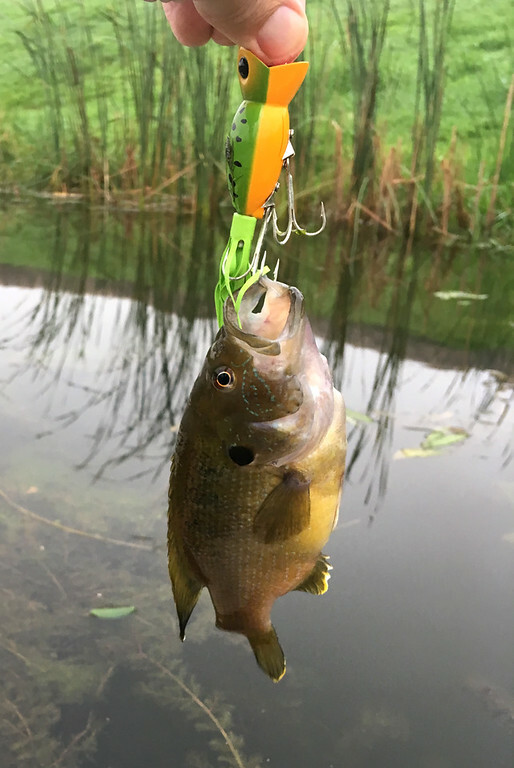 Have never caught perch this large and wish I had planned for keeper fish as they would be packed and stacked in my freezer right now. Mental note to go back to this lake with a basket and target panfish. Couldn’t find any decent largies (or anything else) though and went to a different lake at 10:00. Second lake was about a half mile to the east and also around 50 acres but had a max depth of 60 feet. and clear water. Still couldn’t buy a top water hit, but found some takers with a football jig and squid tail in 10-15 feet of water. Got a few solid to big largies, but the bite wasn’t really on compared to other times I’ve fished the area. Tried to apply side pressure, but he spit the hook on his third jump. Ugh. Judging by the width of his white belly, he was a fatty. I always seem to fixate on the one that got away. 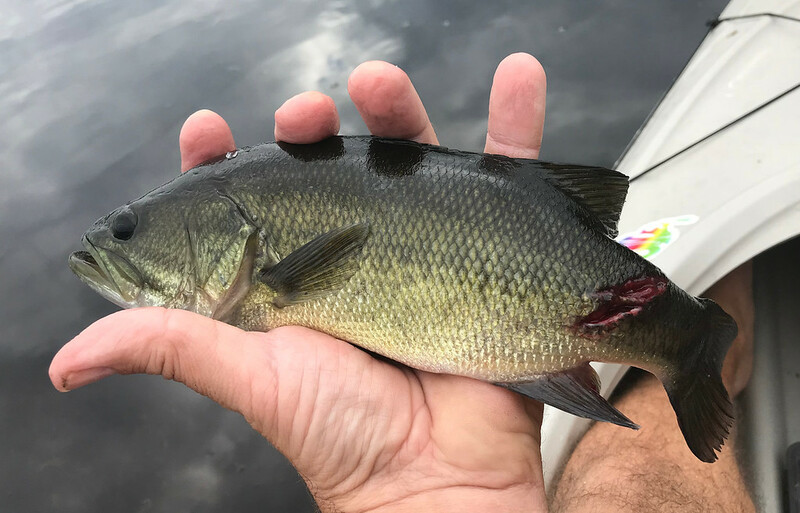 Something with teeth took a chunk out of that Small Mouth. 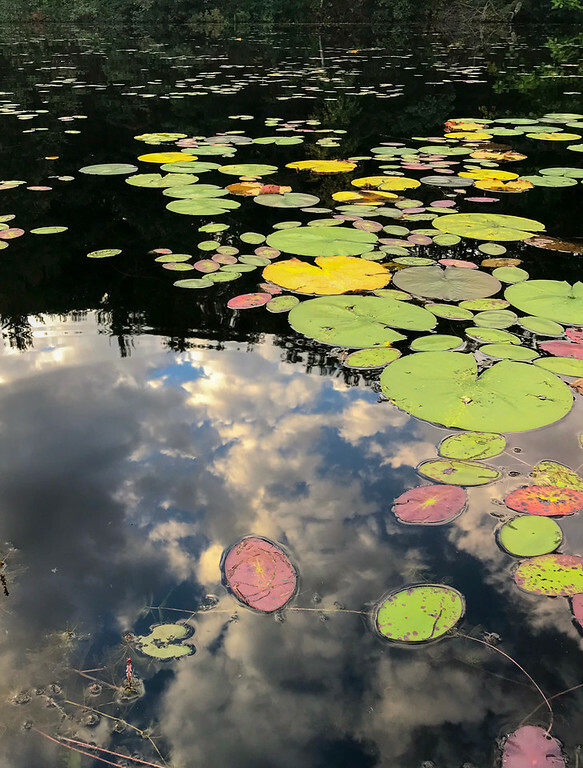 Love that lily pad water shot. Classic Hula Popper or plastic frog water for bass. Yeah that's why I took a photo of it. Was hoping to get the northern (presumably) that did that instead of the snakes. The friend that was with me had somehow never caught a northern before and got a few of the snakes. Told him he'd get real sick of the little ones real soon. I'll be kayak fishing in little lakes until mid-November or as long as it's warm enough too. 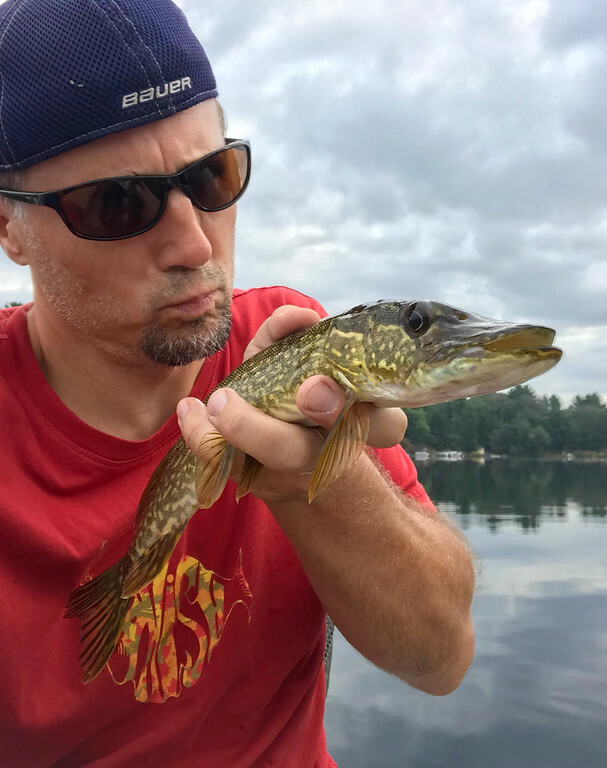 Northern like it and the lakes clear up typically so if nothing else it's fun to see fish. 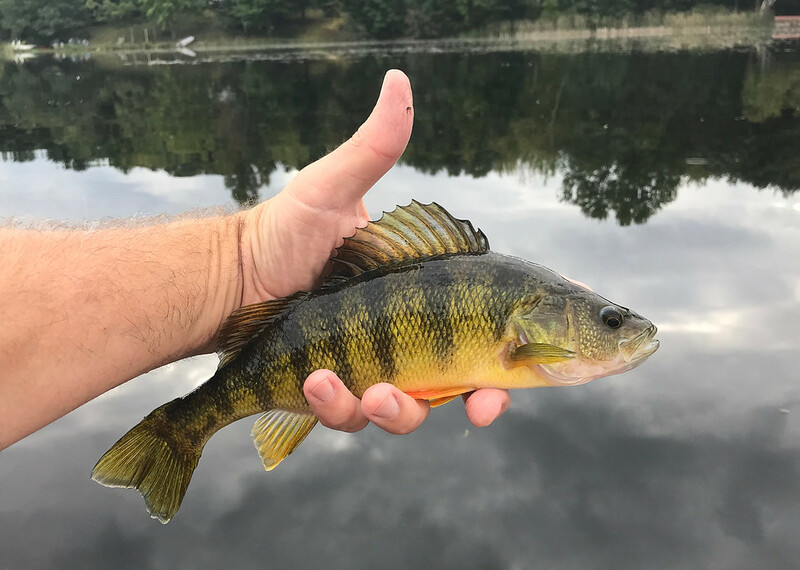 I haven't seen a perch that size since the glory days on Lake Michigan. Good to know they still exist somewhere.